Whenever I think of Hyderabad, I think of it fondly. It was the city where I started my married life; the city which opened my eyes to the real corporate world- the good, the bad and the ugly; the city which gave me great friends; the city where I started to cook for the very first time; the city where the idea to start a food blog first came to my mind. ; the city where I conceived my child. Hyderabad - you'll always be special! If you're talking about Hyderabad, you got to talk about its food. Its a culinary melting pot. The city's cuisine boast of both Nawabi opulence and the South Indian simplicity and earthiness. From fragrant Biryani and rich Kormas to spicy Pulusus, homely Pappus, tangy Charu and comforting Curd Rice. The city has it all. If I had to single out a single dish that I really love from Andhra Cuisine, its got to be Pesarattu. Its a crepe almost like a Dosa but made with Green Moong Dal (Green Gram), instead a of Rice and Urad Dal (Husked Black Lentil). Its a breakfast staple in most Andhra homes. Its filling, nutritious and needless to say, delicious. Its a great start to a day. This can also be a good after school snack for the kids too. 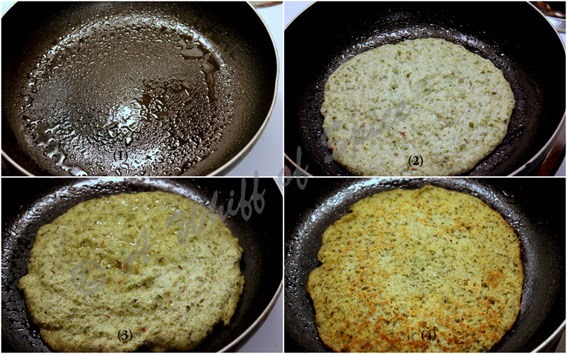 Though,its predominantly a breakfast staple, we have had Pesarattu for brunch and dinner too. Traditionally, its served with Ginger Chutney and Upma (semolina cooked with vegetable). But we eat it with Coriander Chutney or Ketchup. If I'm having it for dinner, I usually serve it with a bowl of piping hot Sambhar and spiced Yogurt. 1. Soak the Green Moong Dal and the Rice in ample cold water, overnight (or at least 4 hrs). Drain the water next morning. 2. In a blender or a processor, blend the drained Green Moong Dal, Rice, Ginger, Onion and the Green Chilies into a smooth batter. Use very little water to blend. 3. Add the Cumin Seeds, Asafoetida (if using) and Salt to the batter and mix well. 4. Heat a non-stick pan. Many of my friends say cast iron pan works best, but I'm still to get a hang of that. 7. Let it cook for 1 to 2 minutes on medium heat. Spray some more oil on the top of the crepe. 8. Flip and cook the other side for another minute or so. 9. Transfer to a plate. Repeat Steps 5-8 for the remaining batter. 10. Traditionally, Pesarattu is served with Ginger Chutney and/or Upma. But lazy people like me eat it with Tomato Ketchup or just plain yogurt. The main ingredient in Pesarattu is Green Gram, which is very high in Protein and Dietary Fiber and has no cholesterol and is low in sodium. However, its high in carbohydrates too. Hence it is best paired with a no carb condiment like Ginger Chutney or Coriander Chutney.